The Board of Trustees of the Village of Pesotum welcome you to the Village of Pesotum website. The public may request information and public records. Please review our website for the information you seek. 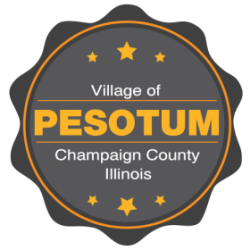 If further information is needed, you may email your request: clerk@pesotum.org, or mail your request to: Village of Pesotum, FOIA Request, P.O. Box 200, Pesotum, IL, 61863. Most FOIA requests shall be promptly responded to within five (5) business days (5 ILCS/140/3) after receipt of the request. A great community south of Champaign.